The best food fight ever in comics history? I say yes, indeed. Chew delivers, with extra cheese and pepperoni. The 50th issue delivers, as I become engrossed in an epic food-powered battle in our eyes between opposite adversaries, Tony Chu and the Collector. Here we are, and it’s personal. The match is great. In one corner, we have the Collector, advantage being his experience absorbing many with abilities for centuries and no moral conscience holding him back in obtaining more. In the other corner, Anthony Chu.. fueled with anger and vengeance with one sister brutally murdered by his nemesis, and the absorbing of a particular chicken upon his cibopathic abilities. That being said, I see John Layman as a writer who does more than just bring us some seemingly random silly powers and likable characters. He had a recipe for a while, at least since the “Family Recipes” arc, for how this outcome draw out. The secret whispered by Antonelle Chu, the senseless murder or Poyo, the alliance between Olive and Mason Savoy. That all comes together in a nice paper platter as many questions now have answers; with the fantastic glazing and basting of the visual tasty art by Rob Guillory. The overall comics meal, makes the outcome sweet, and gratifying. The art continues its stylish, cartoonish tone. 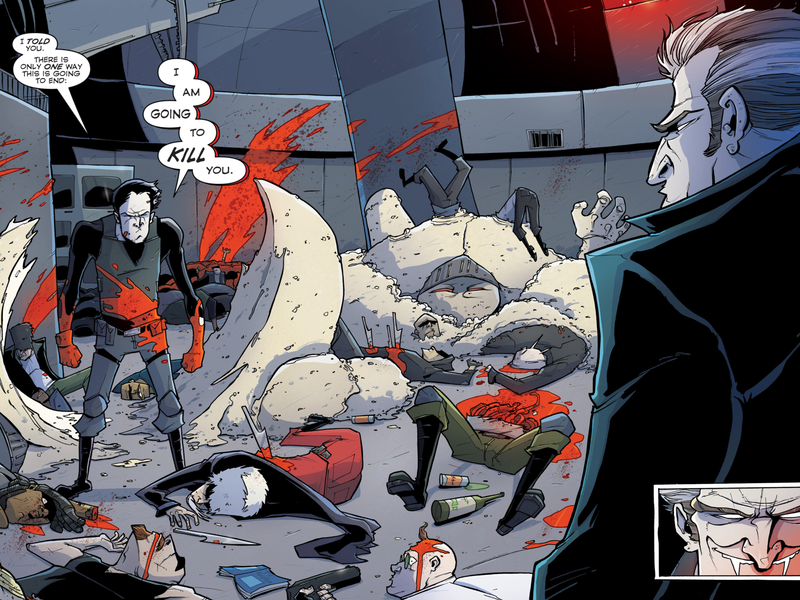 The issue has all the spices of comedy, action, absurdity and seriousness, of which I enjoy Chew by. The facial expressions and sound effect fonts show some pretty intense emotion. 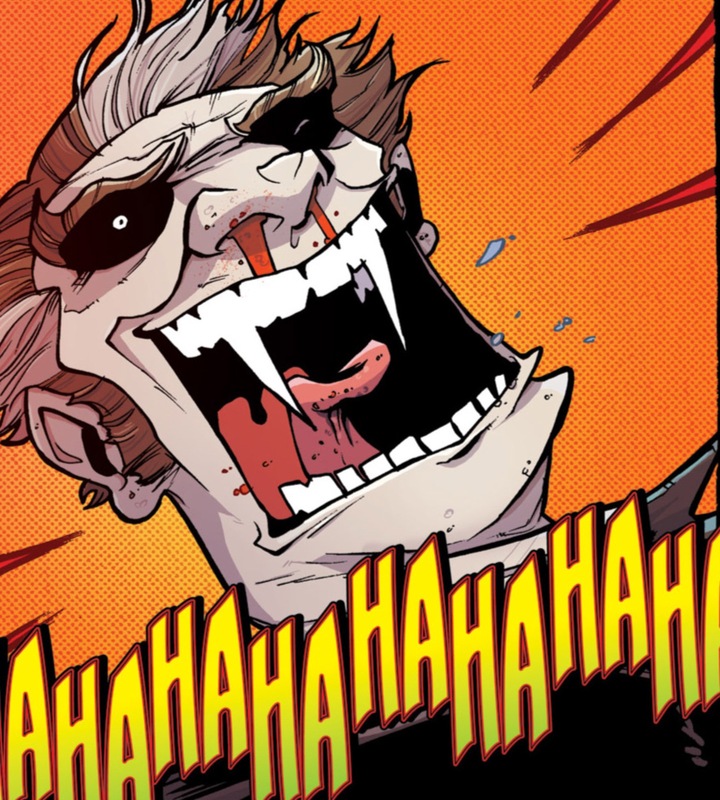 I particularly love this moment..where the Collector carries on the aged trope of that villainous last laugh to a wonderful extreme..
That all being said, the fight does reach a conclusion. There is somewhat of an end, or not. We have ten more issues to go where anything can happen until the finality planned issue of #60. Perhaps, the series direction will turn to the extraterrestrial aspects teased to us, since the first year. 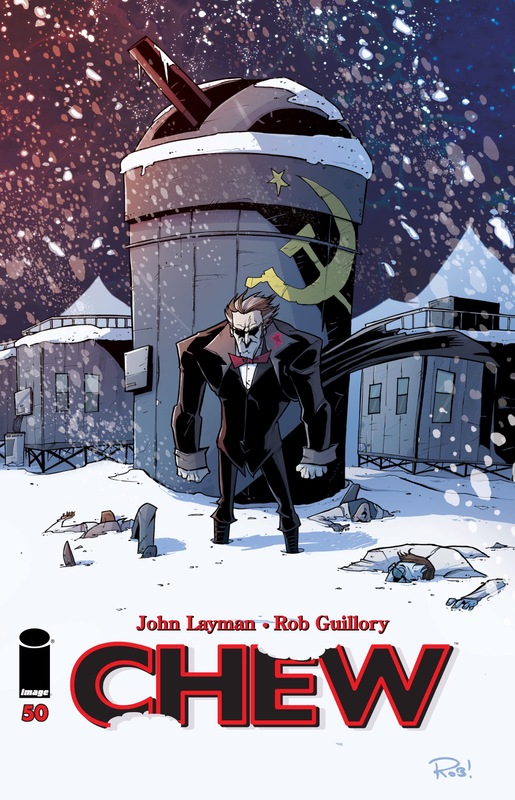 I look forward, as that’s almost another year of new Chew; then I will be sad. But until then, let’s enjoy the meals.